And here’s a closer look at the stitch … isn’t it awesome?! Let’s get started on the pattern. Also available as a convenient 4 Dishcloth Pattern Pack on Ravelry here. Finished washcloth measures approximately 8 inches square. Row 1: Sl st in 2nd ch from hook, *1 hdc in next ch, Sl st on next, rep from * across, turn — 25 sts. Row 2: Ch 2 (counts as 1st hdc), *Sl st in next hdc, 1 hdc in next Sl st, rep from * across, turn — 25 sts. Row 3: *Sl st in hdc, 1 hdc in next Sl st, rep from * across, Sl st in top of turning ch — 25 sts. Rows 4 – 25 : Rep Rows 2 and 3 for pattern. Row 26: Ch 2 (counts as 1st hdc), work 1 hdc in each st across, do not turn or fasten off — 25 sts. Round 1: Work 2 hdc in same st as last hdc of Row 26, continue working a hdc edge around washcloth along next 3 sides, working 3 hdc in each corner. Join in top of beginning ch of Row 26. 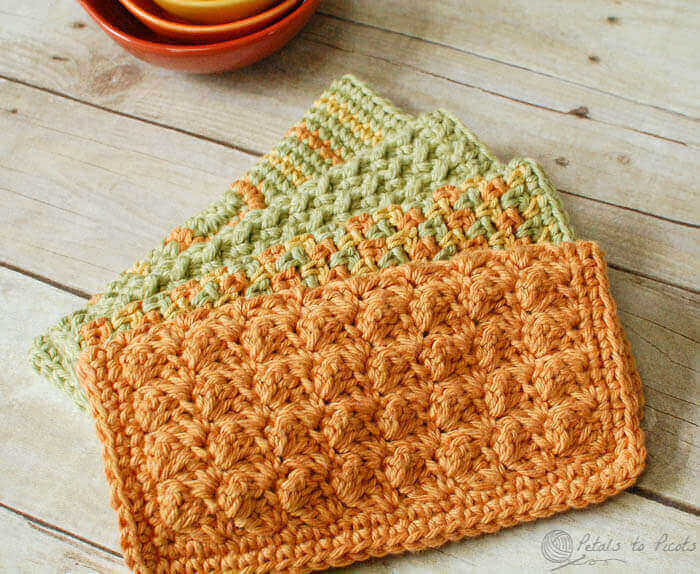 Now that you’ve finished the Crunchy Stitch Dishcloth, try ones of these fun dishcloth patterns … shown below from front to back: Textured Dishcloth, Three Color Simple Stitch Dishcloth, Crunchy Stitch Dishcloth (this post), and Seeing Squares Dishcloth. The patterns are also available as a convenient ad-free pdf for purchase here on Ravelry. Click here for more kitchen crochet patterns. My mistake was on Row 2, following the Ch2: One must Sl St in next hdc, which means you are skipping a stitch (the Sl St from the end of the previous row is skipped). I hope this helps others. I’m a new crochet-er… any chance I could trouble you for a video of the first four rows? I am trying really hard but I can’t seem to get it right. I will add it to my list! The instructions on Row three of the Crunchy Stitch dishcloth are unclear to me. It does not indicate a turn after the slip stitch in the top of the turning chain. My finished product is more diamond shaped than square. Is something missing at the end of Row 3? Please help! I love how this pattern looks. Hi Nina 🙂 Thank you so much for the wonderful compliment! As for the slip stitch, are you referring to Row 3 and slip stitching in the last stitch (the turning chain from the row below)? If so, yes, you would slip stitch into that turning chain. Hi there. Been trying to get this going for a while. I don’t understand the Sl st in top of turning chain. I keep losing a stitch when I do this row. Can aoemonsoy advise me what I am not understanding?? Thank you! It means the turning chain from the previous row. In other words, at the beginning of the row below you started with a ch 2, then in your current row you are going to slip stitch into the top of chain of that ch 2. Make sense? This is the only wash cloth pattern I use now! Thank you so much!! I, too, like other comments posted, love your designs on the dishcloths. I just fell in love with this one – it is so different. I truly like your other dishcloth patterns as well. Love your site. You have some beautiful designs – thank you for sharing them with us. You are a talented lady. Your patterns are unique. Beautiful! Thank you for sharing your talent & patterns with the rest of us. Thank you for this pattern. I made a dishcloth and it is so pretty. I plan of making several more in different colors. Thank you for these beautiful patterns. Recently I prefer cleaning with my own homemade cleaning solutions and the best addition to this are beautiful and useful handmade cleaning cloths and dishcloths. Last week I made some tulle dish scrubbers and all my friends liked them very much. The dishcloths are great too and will do a great job. Thank you for sharing the patterns! My pleasure 🙂 I love using them too! I am SO frustrated! I’ve done up to 15 rows but when I look at the dishcloth, it is all wavy on the edges…as if I have not enough stitches & then too many stitches. But I am counting out 25 each row! Erg!!!!! This is far from my 1st project but I can’t figure out what I am doing wrong! I WILL keep working on it! I’m not sure what I’m doing wrong but I WILL figure it out! This pattern is really cute and looks like the perfect last minute gift. I can’t wait to try it out. I’ve been looking for something to make a gift for the holidays. I’ve also just written my first free eBook for quick gift projects. I would love for you to check it out. Thanks, Cara! Good luck with the new ebook! I would call myself an intermediate crocheter and I actually found this pattern difficult. The stitches themselves are of course not hard at all BUT I had a hard time distinguishing the two types of stitches in the row. Maybe because I was trying to use a two color yarn. Can you give me a guesstimate of how many yards are needed for a one of these clothes. I’m ordering yarn for Christmas gifts and don’t want to have to pay shipping twice if I don’t get enough the first time. Thanks so much! Hi Margery 🙂 I do not know the exact amount per washcloth but I know each one takes much less than a 120 yds ball of Lily Sugar n’ Cream. Hope that helps! I love your patterns and the colors are really nice. I knitted a couple of dishcloths, but I will definitely try these out as well. Just wondering what the multiples numbers are… Thinking about doing a throw like this… Multiples of _ +_? I’ve made a few of the dish cloths with a knit pattern, but I’m a lot slower working with two needles vs 1 hook. Thanks for sharing this beautiful pattern with us. I’m going to tear out the granny square cloth I started and get going on your pattern. I’m sooo excited. Sounds so pretty. So glad it gave you some inspiration! I made another, in a rectangular shape. So quick/giving as a Mother’s Day gift w some soaps. Hi Sharon 🙂 Are you making sure to work in your turning chain? I just finished this one too! I have made 3 of your 4 summer kitchen cloth patterns. I know I will finish the other one tomorrow during my boy’s school lessons. So happy to hear that you are enjoying them, Andrea! Here’s the link to my facebook page showing my dishcloth. These look so much fun! I need to go to your Pinteres with time in my hands. I already pinned some, though. You say you have used worsted yarn for the dishcloths, but how many balls did you use for one? Thank you. Oooh!!! These would be fabulous to make for Christmas gifts!! A great touch for a useful basket of goodies!! Hi. Im just s beginner, what do all the abbreviations mean? when you move on to row 3,do you chain two before stating the row or just turn and slip stitch to start this particular row? I have this question too. Chaining 2 on only one turn on one side made that edge/side uneven/longer. Could you add this for others to see on the pattern. I struggled with the pattern and the ends not working tight and ripped it out twice and finally went through all these comments to find this explanation that made sense. I found that counting the skipped chain to be the first sl stitch of the first row fixes the problem. So you don’t have 2 sl stitches together. 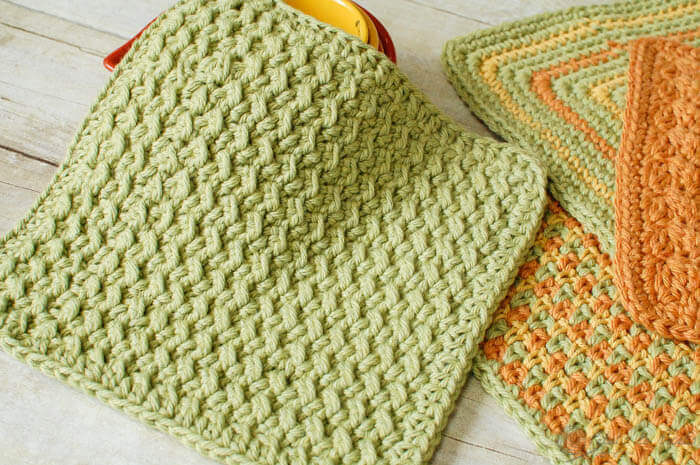 Hello, I really love these dishcloth designs, and also the new Tunisian washcloth pattern that’s coming up. Would it be possible for me to sell the finished items on my Etsy shop, please? Thank you for your help and your lovely patterns. Hi Lissy 🙂 Yes, you may absolutely sell any items you make from any of my patterns. I would love if you would give me credit for the pattern. If you send me the link to your listing, I would be happy to share it on my Facebook page. Good luck! I’m saving this wonderful page not because I love to crochet dishcloths (I hate them lol) but because of the gorgeous stitch patterns. They look like cabled knitting. I want to make a sweater for my guy and these patterns look distinctly dense, warm, and masculine, at least to me! I think the three-color ones are reversible. What about the textures? I read all the comments but I didn’t see a request for the stitch multiple. In other words, I like the design SO MUCH, I would like to use “afghan” yarn to make an afghan, so obviously I would have to chain many more! Do you know how many stitches to increase by for each “design”? Thanks. Hi Viki 🙂 Just start with a chain of an even number of stitches and work the pattern the same. Hope that helps! This whole set of dishcloths would make a perfect housewarming or wedding gift, especially if you know their preferred colors. The textures are not only pretty, but would be good for scrubbing! Lol! Thank you so much for sharing! And, you’re right, it’s a good way to learn new stitches! Can hardly wait to start making these. They look so pretty. Thank you for the patterns. My pleasure 🙂 Hope you enjoy them! Very pretty! Thanks so much for linking up on Hookin On Hump Day! 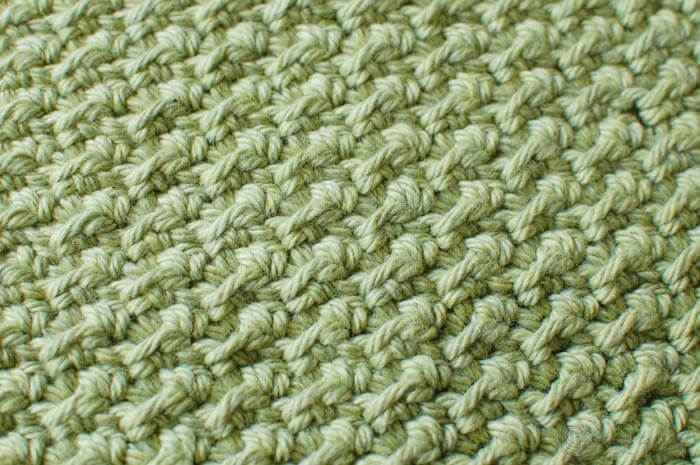 Love the look of this stitch. I have a set of square potted plants and these would make great “coasters” for them. Thanks for the pattern. I love this crochet pattern. I am going to try this out what weight of cotton yarn did you use? Hi Donna 🙂 So glad you want to try it! I used a worsted weight cotton for this. 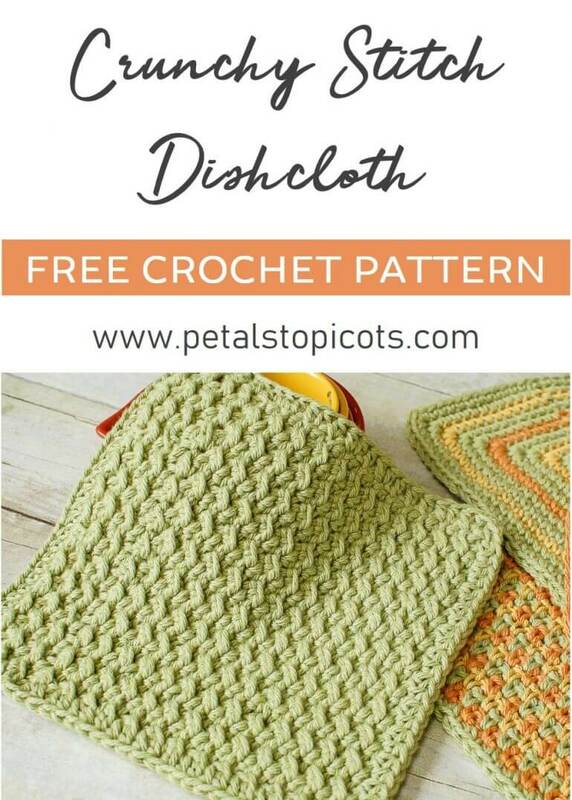 Kara, Thank you for posting these beautiful dishcloth patterns, I will have to try these, I usually just do the traditional ones, but these are much pretty and they look easy to do. Love this! I am going to make this pattern for sure… thank you! Great idea and nice colors, thanks so much for sharing ! I’m halfway done with my dishcloth and its great. Thanks for the excellent pattern and I can’t wait to make more for family and friends. Looking forward to more. Did u ch 2 in row 3? Pattern says nothing about it until u get to last row. Hi Rosemary 🙂 You only ch 2 at the beginning of each even numbered row. Hope that helps! Wonderful pattern. Loved the gorgeous texture. I am going to use it for a purse/clutch. So generous of you to share it. Awesome Kara. You are the best! This looks like such a sweet pattern, and something I can totally make for Christmas presents for my family members… thank you so much for the pattern… can’t wait to try it out! Kara, I’ve knit my share of dishcloths but I’ve never crocheted one. This stitch looks like a good one to try! Thanks so much for sharing! I am going to make this for a gift for a dinner I am going to tonight at a friends house. She just loves homemade things. Hi Mary Lou 🙂 I hope they came out good! They look pretty Kara! Thanks for sharing the pattern. This one looks like a lot of fun! Thanks for the pattern… I will have to try it soon…! Hope you enjoy it, Elena! I finished another market bag: just in time for this lovely dish/wash cloth. Thanks! Hope you enjoy it, Sheriva!